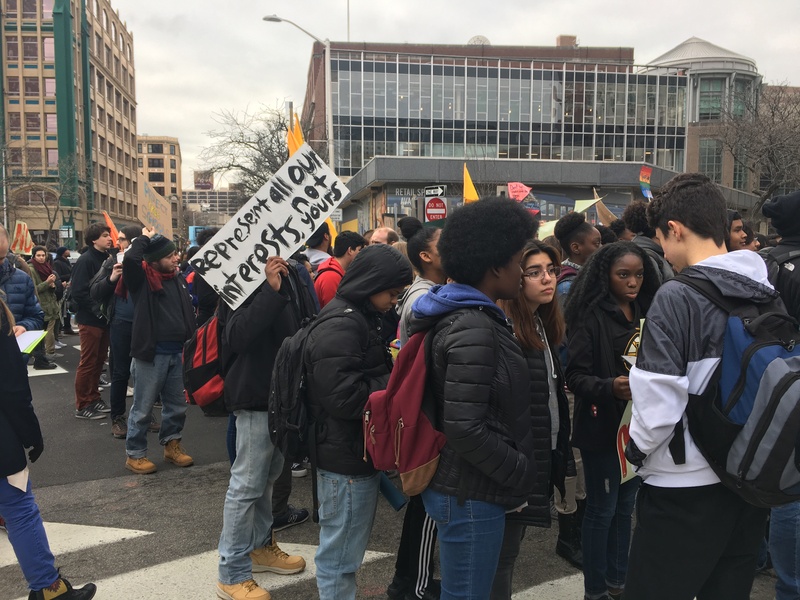 When plans for the march were first announced, there was concern from some high schools students because the march fell on a day of mid-term examinations. 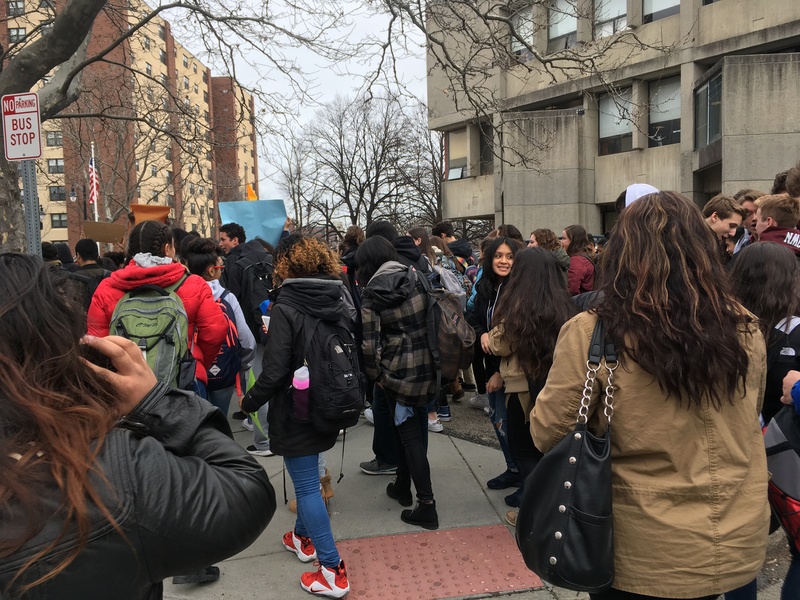 For about a week leading up to the walkout, there were conflicting reports of whether students who participated would be penalized or not, or given zeros on their exams. I have two daughters, a freshman and a junior at Classical High School. They wanted to march, but were concerned about missing their exams. I knew I wanted them to want to march, but that it wasn’t my decision. We talked about the fact that making decisions to stand up for something might mean you put yourself at risk, make yourself uncomfortable, because the people you care about who are being oppressed are often at risk, and live uncomfortably, and don’t have the luxury to choose to forget about what it means to be Black, or Muslim, or an immigrant, or gay or trans, and if it means you sacrifice something to stand up, then maybe that’s what you should do, and not worry about the zeros. In the midst of the girls deciding, with them still leaning strongly toward marching if they knew they wouldn’t get zeros on their mid-terms, an announcement came from the school saying that exams would be postponed to the following week. The students were also unofficially told they would not be penalized otherwise for walking out. 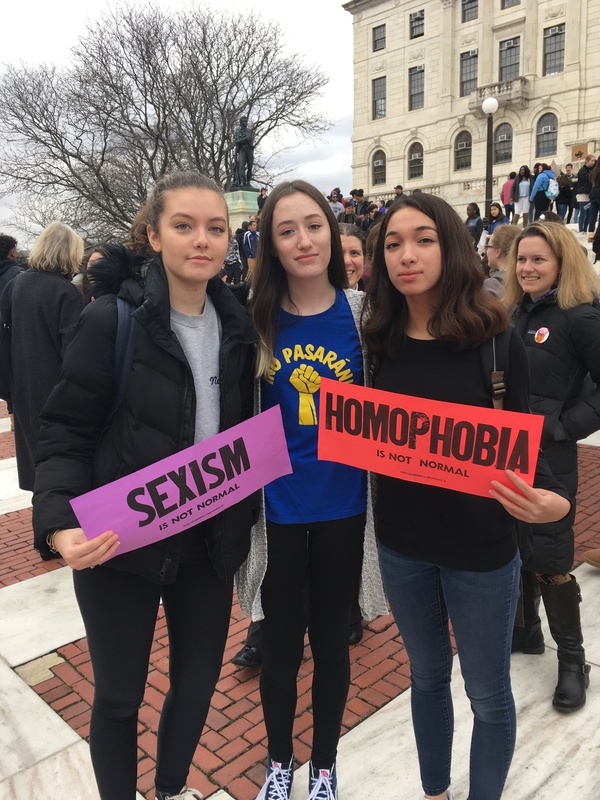 With that in mind, my daughters decided to march, and I know many other students were also relieved to know there would be no repercussion for marching. My daughters and I realized, too, the place our white skin privilege played in how the girls’ decision was made. 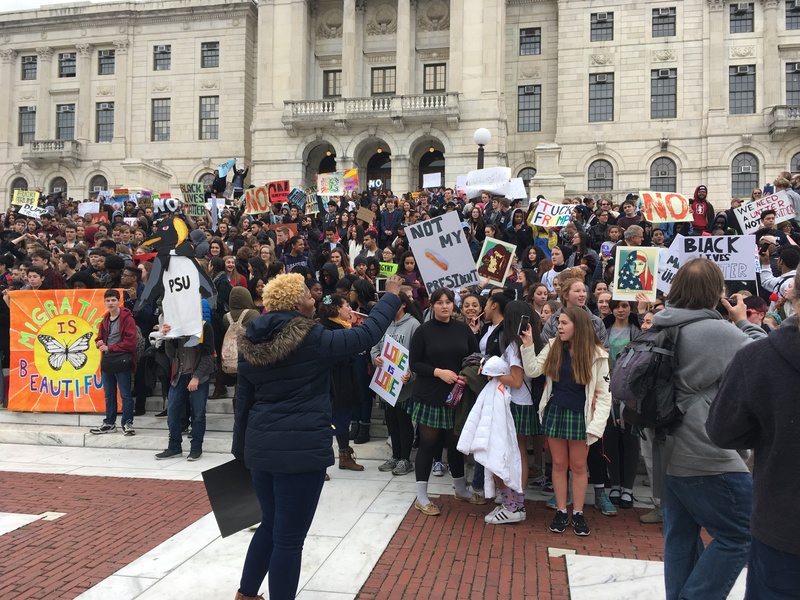 The Walk-Out was organized by the Providence Student Union (PSU), a group of six high schools whose mission is to develop student power to ensure that young people have a say in their education. First formed at Hope High School in 2010, the Union is working all the time on issues important to the young people involved, and has had notable impact, including in 2014, the approval of Bill H-8363, a three-year moratorium on the misuse of the NECAP exam as a high-stakes graduation requirement, and this year, a successful call to develop and implement Ethnic Studies classes into the Providence Public School curriculum. I could not have been more impressed or inspired by the work PSU did to organize and carry out the march, especially when I think about my high school years spent smoking cigarettes in the Girls’ Room, and figuring out ways to sneak into the dance club. 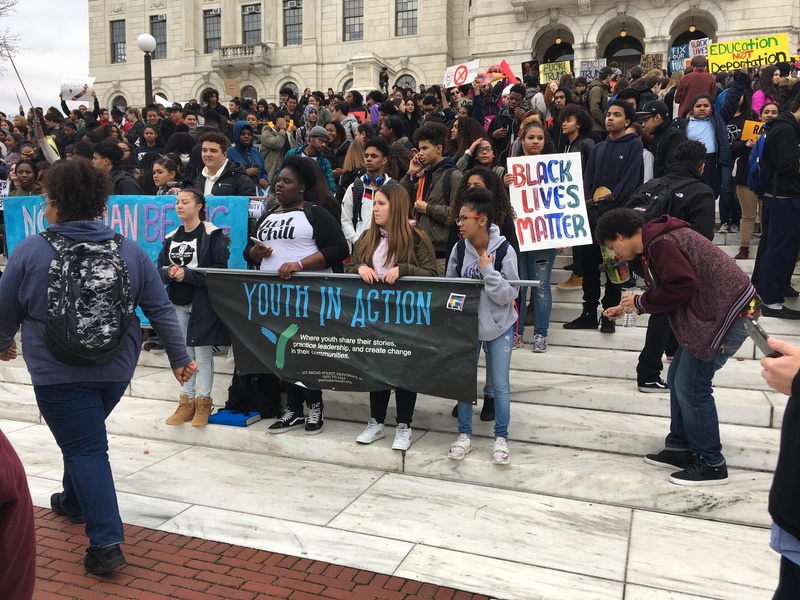 The non-profit organization, Youth In Action co-hosted the Walk-Out. After hearing PSU Executive Director, Zack Mezera’s call for adult ally volunteers to guide and keep students safe during the Walk-Out, at the Resist Hate RI meeting , I decided I wanted to help and was glad it would be on my day off from work, since I work at a hospital, and scheduling is rigid. My girls, Leni, 17, and Darla, 14, were okay with that, and I assured them I wouldn’t be annoying, and get too close to them. This was their thing, after all. When I arrived about twenty minutes before the march was to start, lead adult allies called out instructions to the twenty or so of us standing across from Classical High, some parents, some activists, or mere supporters of the students: “Spread yourselves out alongside the students. Let the students lead the march, this is their event, not ours. Is anyone a medic? Raise your hands, medics…” The official volunteers, of which I was not one, wearing orange arm bands, began to space themselves out in front of Classical and Central High along Westminster Street. My body began to tingle, and I could only imagine the excitement and adrenalin rush felt by all the students as they checked their phones or classroom clocks, waiting for 11:08 to come, the time signifying the date of the fated election, the time to rise up from their seats, walk out, and for many have their first experience in this kind of civic engagement. 11:08. Shouts and cheers abounded. Students poured onto the sidewalk, and the other volunteers and I crossed to the school side of the street. Right away my daughter Leni’s friends called out to me. I waved enthusiastically as I recorded them with my phone camera. The mood was exhilarating. 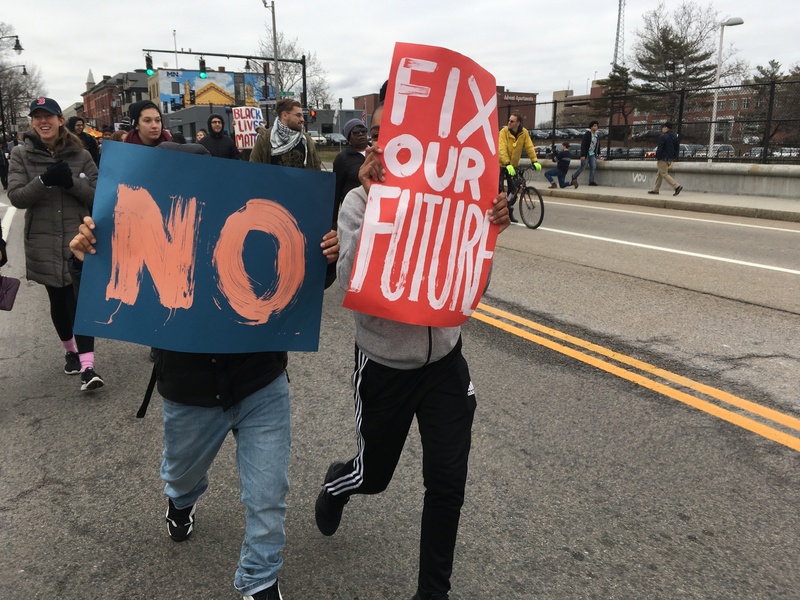 Hundreds of students began their march across the highway and through downtown to the State House. Many carried signs saying Fix Our Future, NO, and the couldn’t be more direct, F*ck Trump, which I saw being printed the night before at an AS220 Community Printmaking event. There were signs written in Spanish, and banners in the front of the march. One featured a beautiful image of a painted butterfly with the words Migration Is Beautiful, and another with No Human Being Is Illegal. 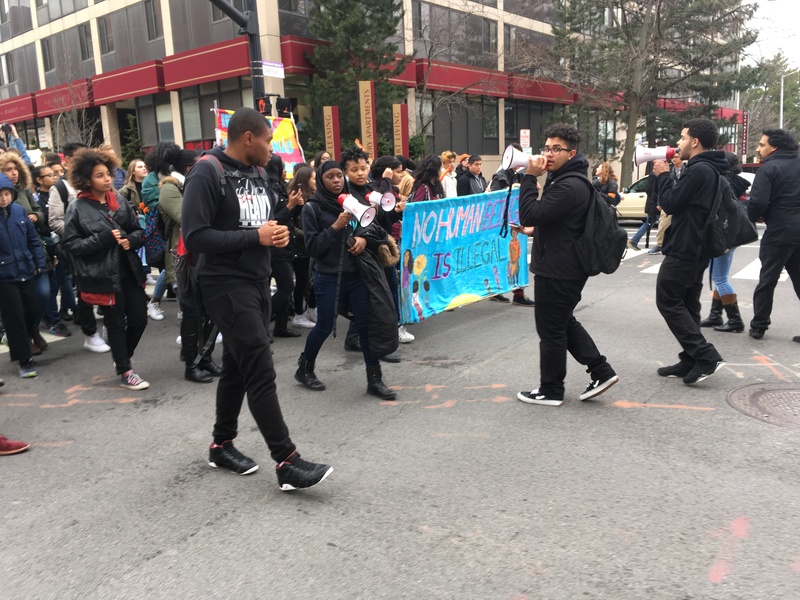 There were young people of all races, ethnicities, sexual orientation and gender identities, all walking together, with youth of color as march leaders carrying megaphones, the majority of them young women with powerful voices. The What Cheer? Brigade street band provided the underlying beat for all to march along to. 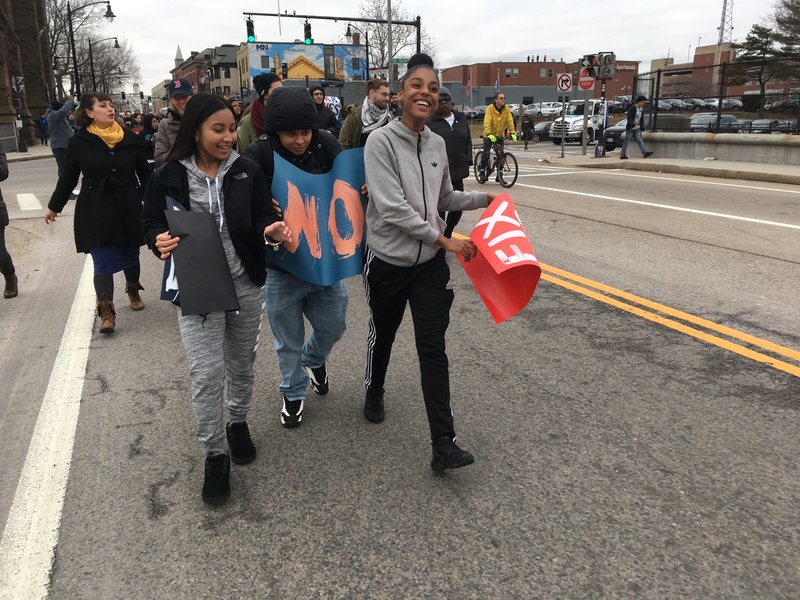 Young leaders halted the march at points to come together, experience the moment, and to chant. The march was so organized there was a printed sheet of chants distributed to follow along to, and a sheet listing steps to take to help PSU fight for a Student Bill of Rights, call Mayor Elorza to help pass the Community Safety Act, an Act to protect immigrants, youth, and keep police accountable to the people, and to find out who your elected officials are to call for the change you want to make. The sheet also contained the names and addresses of the many wonderful, local youth organizations we are lucky to have here in Providence, including Youth In Action, New Urban Arts, Youth Pride, Providence Youth Student Movement (PrYSM), and Young Voices. Everything flowed positively, peacefully, energetically. I finally spotted my younger daughter Darla as we neared the foot of the State House, but she was at enough of a distance that I didn’t want to shout out to her, especially since she is the one nowadays who wants to forge her independence from me, which is a nice way for me to say to myself, that she doesn’t want me embarrassing her in front of her friends. In all seriousness though, as I walked up the steps and came upon the expansive brick landing where I could finally see the students who converged there from all over the city–from The Met School, Times Squared Academy, Hope High, Central, Classical, Alvarez,Village Green, Sophia Academy, Lincoln School, Moses Brown, Paul Cuffee, and Wheeler, (forgive me if I’ve left any school out)–I nearly cried at the sight of over 1,000 of our city’s students completely filling the stone steps of our Capitol Building. They stood there, a sea of smiles, in unity, holding their signs with pride, raising their fists in the air, emboldened. Youth speakers spoke with great poise, determination, intellect, and passion about their fears for themselves, their fellow students, families, and friends under this new administration and smartly spoke of strategies and actions we must all take to rise up, resist, and make changes for a better America for all of us. Mostly young women of color, and several young men of color spoke, including Latifat Odetunde and Musah Sesay, both from Classical High and members of PSU, which for me was wonderful to see, as inclusion, noticing it’s lack, and learning how to de-center whiteness is vitally important to me. Initially it was difficult to hear for the majority adult crowd that had gathered around the bottom of the steps, and I thought wouldn’t it be nice if the State House had provided sound equipment for them to be heard. 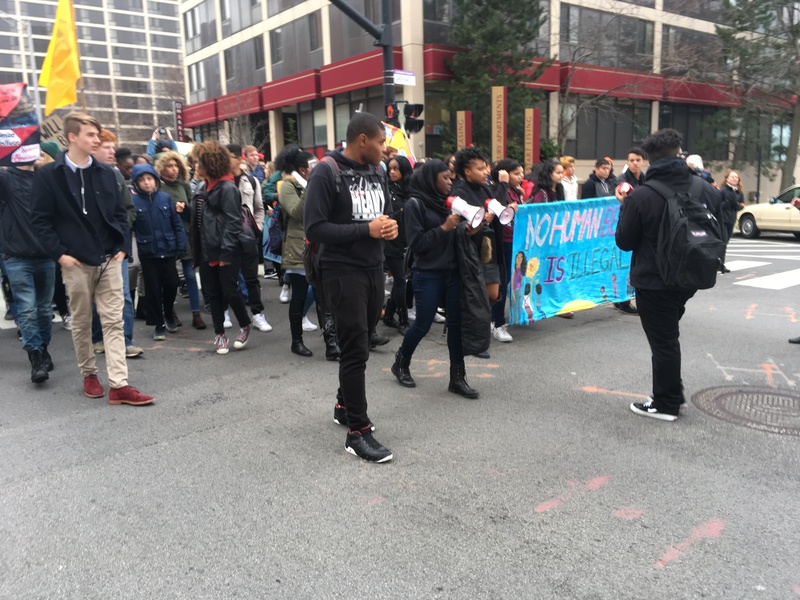 But, creativity and ingenuity ensued, and a double megaphone system, and later, a “human echo megaphone” of the crowd repeating each line a speaker said, helped us all hear the important words these students had to say. 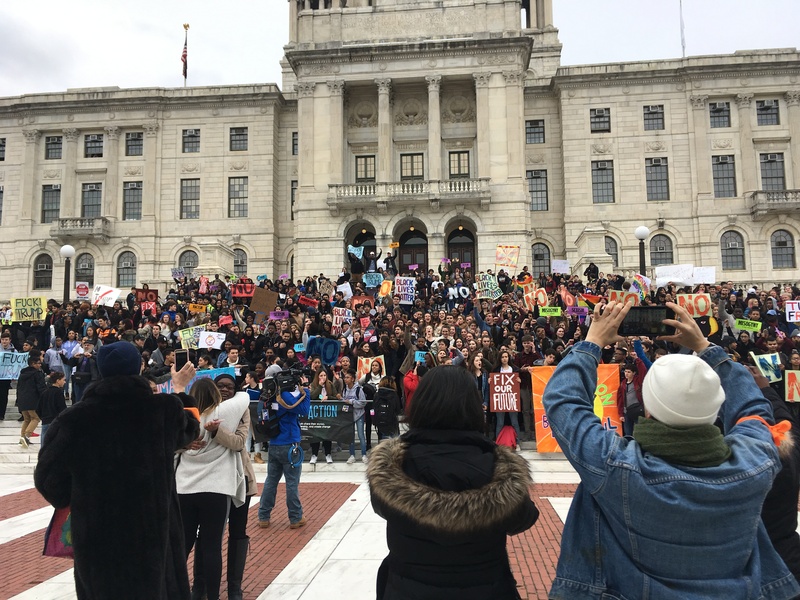 I am proud of all the students, and thank the Providence Student Union and Youth In Action for all of the work they did to organize and carry out the Walk-Out, and I am proud of my daughters. A week before the Walk-Out, when I asked them what they were marching for, they both said to support their friends most likely to be adversely affected by the agenda of the new President. A friend of mine reminded me that my daughters, who by virtue of being female, and Jewish, and who come from Native American lineage on their Dad’s side of the family, are also targets of the Administration. We are all connected, and we all need to do the right thing when it comes to ensuring the liberty and safety of all of our fellow Americans. We might not be able to be involved with every cause that has meaning to us at the level we wish we could, and street demonstrations aren’t for everyone, but there are many ways to get involved, and ways to find the right way for you to get in where you fit in. 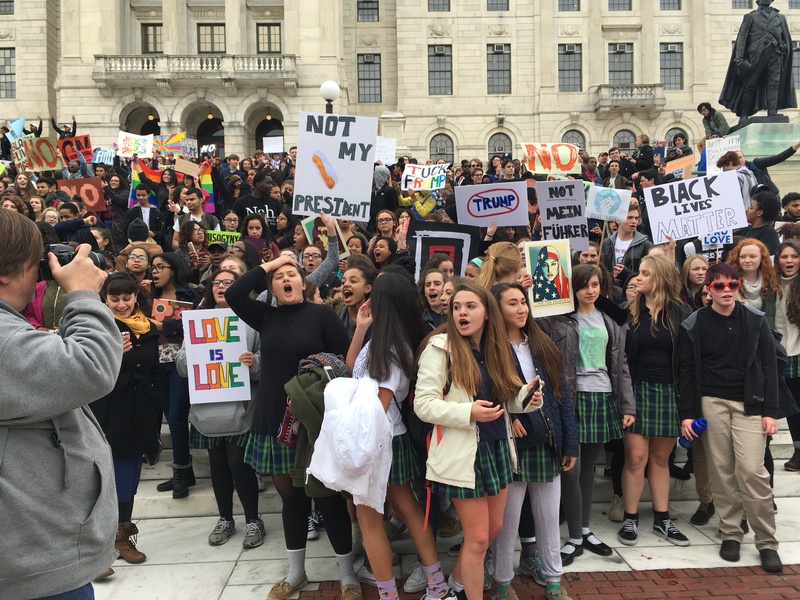 I have only the highest praises for the Providence Student Walk Out, and thank you all for the inspiration you bestowed upon me, and the tingle in my body that continues to resonate, and the memory and pride that lingers, even more so for me, than the local Women’s March has, which took place the very next day, and had five times as many people attend. Outside Classical High School the Walk-Out Commences! Greetings to you and to you, Wendy Jane, my so, so very For Always absolutely special and dearly precious, awesome soul sisterfriend Jewish woman who you’re for Always so, so very much!!!! Wow, sister, wow, Wendy Jane!!!! I just so, so very much love this absolutely beautiful, brilliantly, sensitively, and lovingly composed in such a sensitively heartfelt manner blog post article here of yours, Wendy Jane!!!! I can just tell how hard you worked on this in such a very diligent and conscientious manner, and this very fine and excellent writing here is just so, so very rich and full of such thorough details accompanied by some very lovely and empowering pictures which perfectly add to and complement this very superbly super article accenting your engaging article to the very heights of perfection, my friend!!!! Wow!!!! Yay!!!!! Sister, I, too, am just so, so very proud of awesome Leni and astounding Darla, their so cool full of spirit friends, and all of their marvelous friends, and all of the young people!!!! I am just beaming with such being so, so very proud of them!!!!! My very heart was so warmed and leapt for joy as I am just so, so very proud of our young persons and they give me such a greatly and immensely increased faith, hope, and such a positive optimism for our future because they are our future, sister!!!!! Sister, i like you tingled in my body because I am just so, so very thrilled, overjoyed, and happy at all of the great and powerful work each and every one of you has so finely accomplished in such a productively proactive manner also YOU, dear, dear precious Wendy Jane, and all of the other adults as well!!!! You all just keep this disabled, indigent lesbian black woman keep on keeping on in keeping my very faith and hope alive with my For Always eternal positive optimism, sisterfriend!!!!! Wendy Jane, I’m just so, so very relieved, too, that dear Leni and dear Darla and the other spectacular students won’t miss out on their mid-terms and won’t get a zero on them and that the date of the mid-terms will be at a later date! Sister, you are so right-YOU, and Leni, and Darla are also targeted and oppressed by that evil man who is such an absolute monstrosity as President(I refuse to say his name and I cannot say his name, either) because of the vile, perniciously pervasive nature of antisemitism because you all are such beautiful Jewish persons, souls, and spirits, and with you being a woman, Wendy Jane, and with Leni and Darla being girls you all face, endure, and experience evil, perniciously pervasive sexism and misogyny, too, with even more oppression here. Wow, it is so nice to read again about Leni’s and Darla’s Native American ancestry on their father’s side of the family!!!! This is just so, so very cool, Wendy Jane!!!! This is another reason for oppression and discrimination as well. Sister, you might remember me mentioning that my paternal great-grandfather was a Native American from the Blackfeet tribe. My family was very secretive about him and that connection. All I remember was that when I was about 10 or 11 or so that my father said he wanted to talk to me and then very briefly said that my paternal great-grandfather was a Native American from the Blackfeet tribe, then abruptly ended the conversation with no further discussion and walked away. There never ever was more detailed discussion on this, sisterfriend! I remember that when I was a toddler I noticed how straight my paternal grandfather’s hair was-not like an afro-and I kept asking about his hair but I was sternly warned to stop keep asking about his hair! My paternal great-grandfather was dead before I was born. Sister, as I For Always think, feel, believe, and say I For Always have such complete love for, trust, faith, hope, confidence, and belief in YOU, dear, dearest Wendy Jane, and in other awesome white people that each and every one of you can for certain learn, heal, grow, recover in your anti-racism, and gain in your racial awareness. I will For Always love YOU, my so, so very dearest and darling friend and sister, Wendy Jane, and other splendid white persons as children of our Good God and as my sisters and brothers, very, very especially YOU, Wendy Jane, and other so, so very right on, wondrously wonderful white women because I just so, so very much love and cherish YOU, my friend, and other awesome white women with each and every one of you being my very, very heart, and also my very, very heartsblood, and my very lifesblood, and lifeblood, and I think so, so very highly of YOU, Wendy Jane, and of other super white women!!!!! I don’t care and it doesn’t matter to me about whatever racism, oppression, and discrimination I have faced, endured, and experienced, or will face, endure, and experience, and I don’t care and it doesn’t matter to me what I will face, endure, and experience this way even with how white women and girls, and all white people in general are more highly valued, seen as more important, more special, and more significant because I will no matter what For Always love you all as white persons, very, very especially YOU, Wendy Jane, and other absolutely fantastic white women!!!! This is my sacred promise to our Good God and to you all for sure with all of my very, very heart, and also my very, very heart, mind, soul, and spirit with all that I have with all of my very being!!!!! I’ll never ever give up on YOU, sister, and on other marvelous white people, and you all can for sure count on me to have your backs and to For Always very delightfully and eagerly cheer for each and every one of you rooting so, so very heartily for each and every one of you!!!! Yay!!!!! Wendy Jane, I feel even better and brighter with even more cheer from this very insightful and inspirational blog post article here!!!! 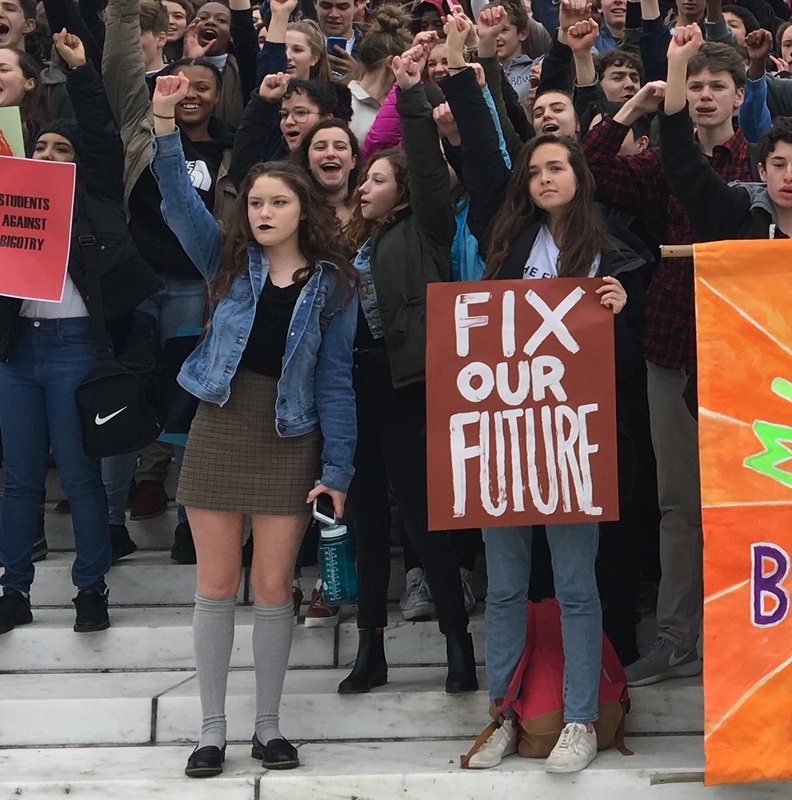 Wow, I am just so, so very encouraged, emboldened, and inspired here by all of you-young people and adults alike doing just great work and activism here!!!! Sister, please have such a wondrously wonderful Wednesday and may all of your days be so, so very especially blessed!!!! I love you so, so very much, my so, so very sweet Jewish sister and friend!!!!! :)!!!!! !